This serving pitcher is perfect for lemonade, fruit drinks or iced tea. It's tall design adds style to any kitchen. Has a matching lid that slides from side to side for easy pouring and closing. Comes in a variety of colors including green, orange and pink. Can hold 1.6 liters of liquid. 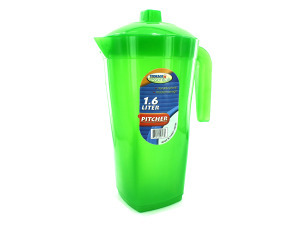 Pitchers are packaged loose with a sticker label. They measure 9" tall and have a 5" diameter. 24 pcs. — — — 48 pcs.